SEIU Healthcare Minnesota members (L to R) Pam Ganser, Amy Pauly and Jodi Klembrook delivered a petition opposing Andy Puzder as labor secretary to Sen. Al Franken’s office in St. Paul. Working people aren’t waiting for fast-food CEO and robotics enthusiast Andy Puzder’s confirmation hearings – twice delayed because he’s having difficulty completing the required ethics paperwork – to oppose President Donald Trump’s nominee for Labor secretary. 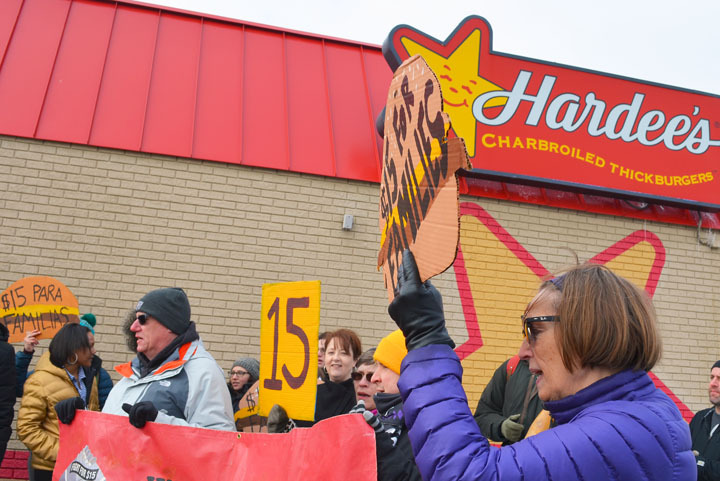 Last week fast-food workers led a demonstration outside Hardee’s, a chain operated by Puzder-led CKE Restaurants, in St. Paul. 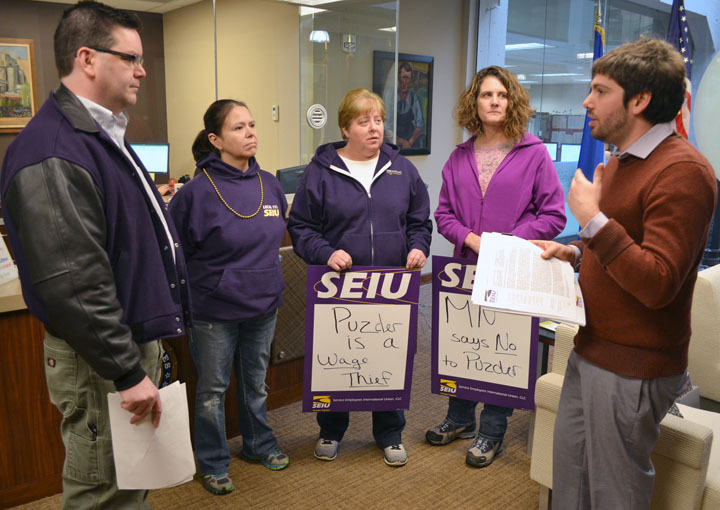 And this morning, members of SEIU Healthcare Minnesota delivered a petition to Sen. Al Franken’s office in St. Paul with nearly 5,000 signatures opposing Puzder’s nomination. Similar actions have popped up across the U.S., with more coming as Puzder’s confirmation hearing, set for Feb. 7 (if he can wrap up that pesky paperwork), draws nearer. Why can’t working people stomach Puzder at the helm of the Department of Labor, an agency charged with enforcing and administering federal labor laws, from health and safety protections to overtime and discrimination rules? 1. As an employer, Puzder’s company has a disturbing track record of violating laws designed to protect working people. An analysis of Department of Labor data by The Century Foundation found that since Puzder took over as CEO in 2000, at least 1,563 CKE workers have been exposed to wage theft, unsafe working conditions or other violations uncovered by the agency’s inspectors. Combined, OSHA and Wage-and-Hour inspectors have closed 166 investigations of CKE facilities since 2000, leading to more than $156,000 in civil penalties and an additional $145,310 in back pay to 877 employees. In one case, Hardee’s restaurants in the St. Louis area were “having workers punch-in to work later than when they arrived to work, not paying them overtime for double shifts, and even striking hours off of time cards,” the Century report’s authors, Michael McCormack and Simon Glenn-Gregg, wrote. Additionally, workers at 13 CKE restaurants in 10 states last week filed 33 new complaints alleging sexual harassment, unfair labor practices (union busting) and wage theft. 2. Last year, Puzder earned more in one day than his company’s minimum-wage workers earned in the entire year. Yet he not only opposes raising the wage, he spends his fortune financially backing efforts to stop it. Opponents of Andy Puzder’s nomination to lead the labor department rallied last Thursday outside Hardee’s in St. Paul. 3. Puzder’s low-road approach to employment forces taxpayers to pick up the tab – to the tune of an estimated $247 million per year. The National Employment Law Project ran the numbers in a report released last week, coming up with the jaw-dropping price tag for government services accessed by CKE employees. The report draws on an analysis by University of California Berkeley economists who found that low wages and lack of benefits force 52 percent of fast-food workers to rely on public assistance to make ends meet. 4. Puzder’s company outsourced jobs to the Philippines. In 2010, according to a report by the Associated Press, CKE laid off 20 Americans employed in its restaurant information technology department, which later reopened in the Philippines. The decision also resulted in layoffs at a staffing firm in California. 5. His public statements reveal contempt for working people, particularly those people most vulnerable to the kinds of mistreatment the Department of Labor is supposed to police. American, indeed. Just like low wages, outsourcing and corporate welfare. It’s no surprise working people are raising hell.